Someone recently told me a good rule about country music is that ‘if you can twang it, you can sang it.’ I had to laugh at the notion, but when it comes to classic country music I couldn’t agree more with that sentiment. 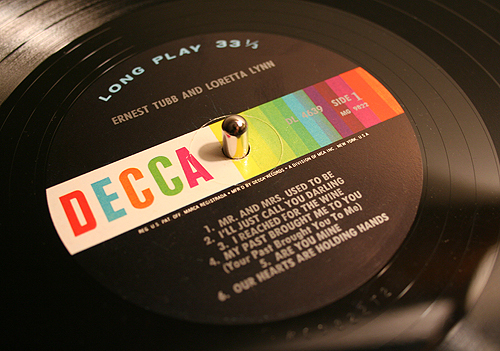 Two of country’s most prominent icons, Ernest Tubb and Loretta Lynn, teamed up to unload “Mr. And Mrs. Used To Be” on the masses, a collection of songs about woe, heartache and joy between two people who could honesty love and/or hate each other with a smile upon their faces. However, these two respected crooners of country love keep it classy and conservative, as they trade line for line. Tubb’s authoritative vocal presence, coupled with Lynn’s Appalachian twang work well together in their duets, delivering the kind of country duet LP you’d expect to know and love. This album, which marks the first of three duet albums Tubb and Lynn would record during the 1960s, was extremely popular with country music fans, especially with the title track, reaching the number 13 spot in the US Country Music Charts. The entirety of the album is composed of covers, including the previously recorded duets of “A Dear John Letter” and “Are You Mine.” Tubb actually recorded “A Dear John Letter” with his daughter, Elaine, back in 1953. It shocks me to know this record wasn’t made available in a complete digital format. From what I could tell, several of these songs appear on various compilations and ‘best of’ collections, but not as a single album. Sadly, it’s just another realization that much of the recorded music released during this time was never produced on the easily accessible CD. For what it is worth, “Mr And Mrs. Used To Be” is just another excuse to keep your turntable working overtime. 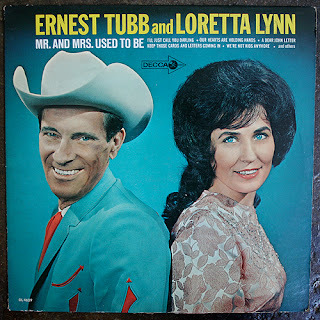 I’ve been somewhat familiar with these giants’ music catalogs for a few years now, but hearing Loretta Lynn alongside Ernest Tubb was a real treat. I especially liked listening to more of Lynn’s vocal work, as I was able to see and hear Lynn’s influence on another country rocker chick I love a ton, Lucinda Williams, allowing country music to come full circle for me. The image of Lynn and Tubb on the album cover is timeless. The blue in Tubb’s suit, along with the red accents really pop, as does the ocean teal background. Lynn’s dated beehive hairdo, and the ‘hurry up and take the damn picture already’ smiles let you know this record is going to be good. Throw in some dripping wet pedal steel guitar and you have yourself a winner. Fifteen years ago I wouldn’t have touched a country record with a stick, but as I get a little bit older, and my taste in music matures, country music (as I know it) just sounds cooler and cooler. It’s influenced by the blues and bluegrass, which in turn, influenced rock and roll. Everything is connected within these genres, and I’m happy to know I have the mental capacity and patience now to take it all in and enjoy. I also know intuitively if I’m going to like a record based on the album cover art. When it comes to vinyl records I never miss. Sadly, Ernest Tubb is no longer around for me to say ‘thank you’ to, but maybe I’ll get a chance with Loretta Lynn some day. “Mr. And Mrs. Used To Be” definitely adds some color and style to my record collection. Keep your eyes peeled for this one in the used section. This entry was posted on Friday, July 22nd, 2011 at 12:01 pm	and is filed under Music. You can follow any responses to this entry through the RSS 2.0 feed. You can skip to the end and leave a response. Pinging is currently not allowed.